Charles Darwin and Alfred Russell Wallace, co-discoverers of the principle of evolution by natural selection, held starkly contrasting views about the origins of the human mind. Wallace considered the human mind to be qualitatively distinct from that of other animals, while Darwin postulated that animal and human minds differ in degree but not in kind. Darwin’s position, but not Wallace’s, represented a sharp break with traditional Cartesian views that human behavior is rational, but animal behavior is instinctive. Controversies over the nature of animal/human mental distinctions continue to this day. Many, perhaps most, students of human evolution have continued to hold Cartesian views of human uniqueness. When, in the 1960s, great apes successfully challenged traditional views that humans are the only animals that can make tools or use symbols, anthropologists, psychologists, and linguists were quick to define new areas of human uniqueness such as theory of mind, cooperation, and syntax. These, too, have now been challenged by great apes. Hence, while many scholars continue to argue that human mentalities are qualitatively unique, others now advocate a more Darwinian approach. They accept that great apes possess the rudiments of many object-manipulation, social and communicative behaviors once considered unique to our species, but recognize that human abilities exceed those of the apes in each of these domains. This presentation argues that humans possess increased information processing capacities across a variety of behavioral domains. Hence, humans can construct more information-rich and hierarchically organized motor sequences, objects, communications, and socially-cooperative actions. Qualitative gap models have also tended to dominate interpretations of the archaeological and paleoanthropological records. Not so long ago, it was nearly universally agreed that the first manufactured stone tools were produced by early members of the genus, Homo, and that fully modern mental abilities arose very suddenly about 40,000 to 50,000 years ago with the appearance of the Upper Paleolithic. New findings challenge these views. These include manufactured stone tools from Lomekwi, Kenya (3.3. mya), complex tools from Africa which long predate the Upper Paleolithic, Indonesian paintings dating to about 40,000 years ago, and increasing evidence of Neanderthal “symbolic” activities and of interbreeding between Neanderthals and modern humans. This talk discusses this new evidence in light of continuity versus qualitative gap perspectives of human/animal and modern human/fossil hominin mental differences. It concludes that much of what we see in the archaeological record accords with an increased information processing model of tool-making, cooperative, and communicative abilities, and, hence, with Darwinian views that differences of degree, rather than of kind, distinguish human from animal minds (and by extension modern human minds from those of other hominins). 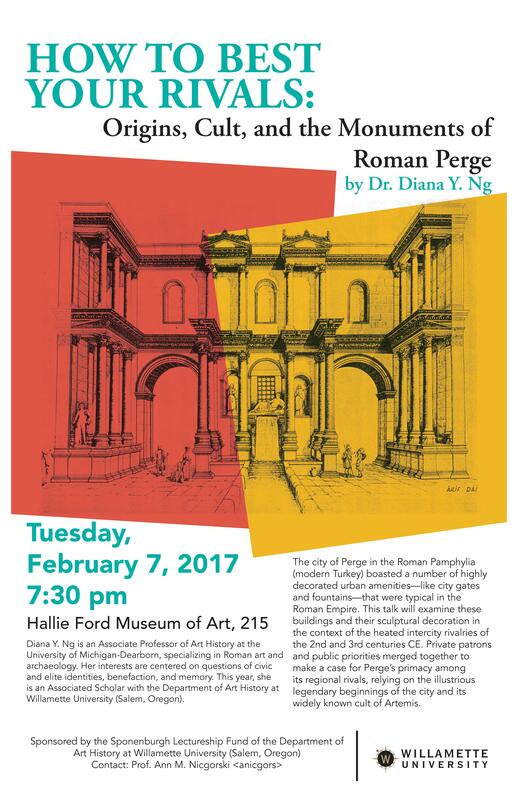 Join us for an afternoon of celebration and catharsis over this turning point in Roman history. 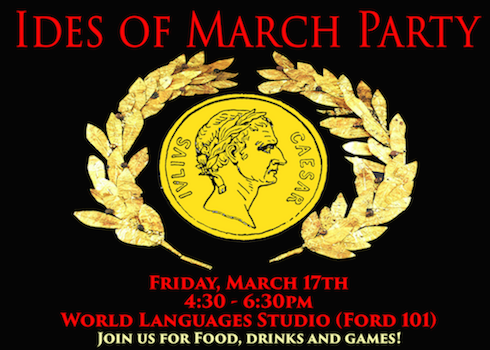 There will be themed food (such as pizza, salad, and cupcakes), sanguine drinks, and games involving effigies of Caesar! The event will be held form 4:30 to 6:30 pm on Friday, March 17th in Ford 101. All are welcome to drop by during that time frame! Please join us this Thursday afternoon! 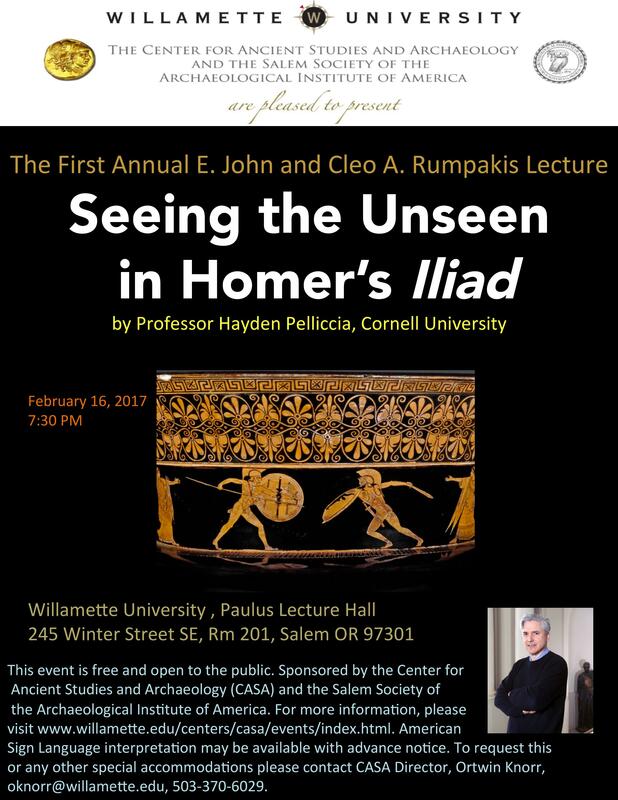 As usual, this lecture is free and open to the public! Thursday, March 9, 2017, 4:30 p.m. 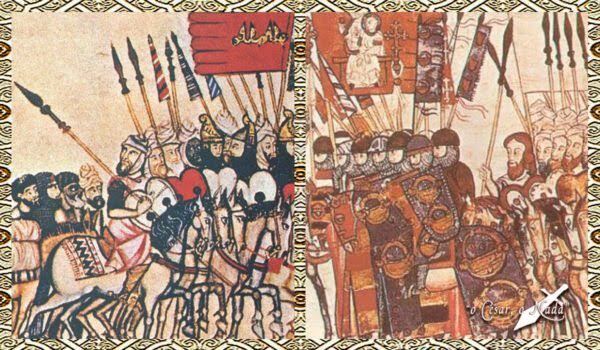 The medieval battle of Alarcos (1195) was the last great victory of Moslem against Christian troops in Spain. Having received information that the Almohad caliph Yaqub al-Mansur was gravely ill in Marrakesh, King Alphonso VIII of Castile decided to attack the Almohad possessions in Spain. Spanish and Moorish troops clashed at the castle of Alarcos, which marked the southernmost extension of Alphonso’s realm. The battle ended in a decisive, yet ultimately short-lived victory for the Moors. 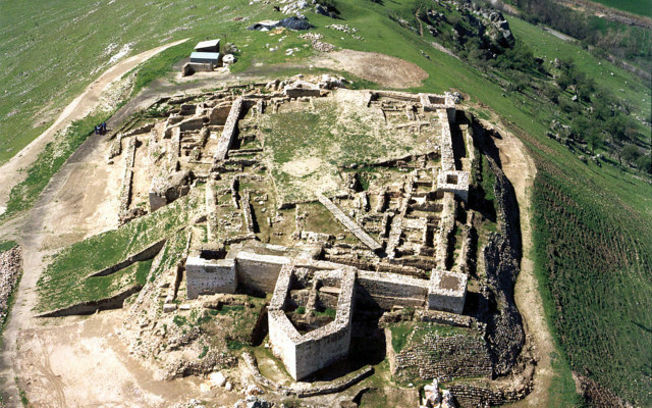 Today, the ruins of the Castle of Alarcos and the surrounding battle field are well known. The castle has been excavated, but the battle field has not yet been surveyed, and little has been done to attract visitors. Dr. Ramírez Galán will present the results of the castle’s excavations, suggest a reconstruction of the different stages of the battle, and discuss how the battle field could be preserved so that modern visitors could walk through the site and experience the battle as it evolved. Alarcos (Ciudad Real), Julio 2003.- Imagen aérea del Parque Arqueológico de Alarcos en Ciudad Real. Note to AIA members: This is an afternoon research talk in Eaton Hall 412, not in the Law School. Off the northernmost tip of Scotland lies the Orkney Islands where it is said that if you scratch its surface Orkney bleeds archaeology! This is nowhere truer than in the Heart of Neolithic Orkney World Heritage Site that is renown for some of the most iconic prehistoric monuments of Atlantic Europe: the great stone circles of the Ring of Brodgar and the Stones of Stenness; Maeshowe the finest chambered tomb in northern Europe; and the exceptionally well preserved 5,000-year-old village of Skara Brae. Recent research and excavation in this area is radicalizing our views of this period and providing a sharp contrast to the Stonehenge centric view of the Neolithic. In particular, the stunning discovery of a Neolithic complex at the Ness of Brodgar that was enclosed within a large walled precinct is changing our perceptions. The magnificence of the Ness structures with their refinement, scale, and symmetry decorated with color and artwork, bears comparison with the great temples of Malta. These excavations are revealing a 5,000 year old complex, socially stratified, and dynamic society. The Ness excavations were recognized by the American Institute of Archaeology as one of the great discoveries in 2009; named the 2011 Current Archeology Research Project of the Year; winner of the international Andante Travel Archaeology Award in 2012; and featured in cover article in National Geographic in 2014. The excavations are directed by Nick Card who has lived and worked on Orkney off the north tip of Scotland for more than 25 years. He is Senior Projects Manager of the Orkney Research Centre for Archaeology, University of Highlands and Islands Archaeology Institute that he helped to establish. 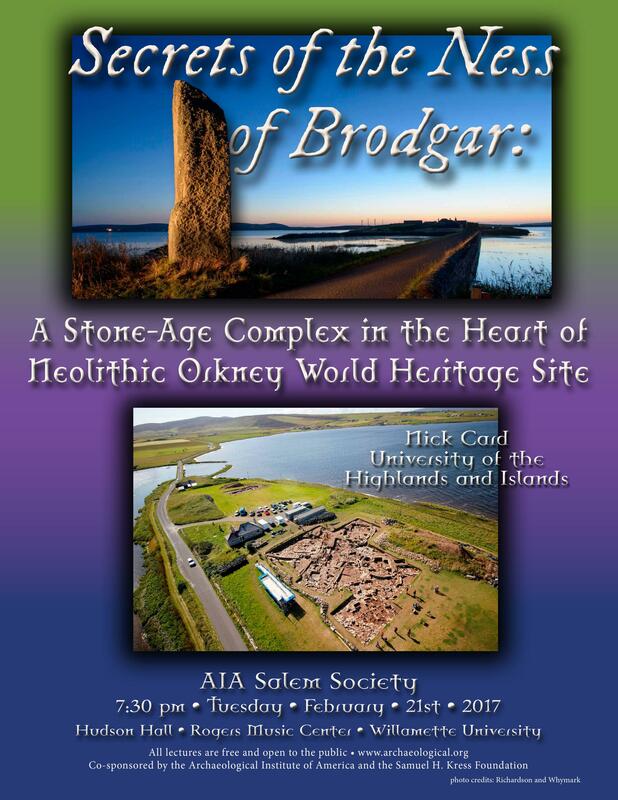 He is also a Member of Heart of Neolithic Orkney World Heritage Site Research Committee; an Honorary Research Fellow of the University of the Highlands and Islands; Chair of the Ness of Brodgar Trust and Vice-president of the American Friends of the Ness of Brodgar. The Office of Admissions is in need of current students who are Classics majors to meet with prospective students upon request. This will entail either a FREE LUNCH or FREE Bistro treats. If you are interested, please e-mail tkonik@willamette.edu and you will be put on their list to be contacted when necessary. This is a great opportunity to grab some free food, meet with future bearcats, and grow as a leader and mentor. Many of us have been asked what the possible use of a classics degree is. Here is one student’s answer.